Newark Natural Foods is a not-for-profit natural foods store owned and operated by the membership of the Newark Community Cooperative. It is professionally staffed, but it is governed by a democratically elected Board of Stewards. We are open to the public. We also publish a quarterly downloadable newsletter on our website. 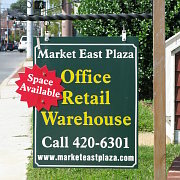 Located on Main Street in Newark Delaware, USA, Market East Plaza is well situated to serve both University of Delaware students and Newark Residents, providing Office, Retail and Warehouse space for a variety of local businesses. Whether you are a shopper or business owner, we think you'll be surprised at the variety of products and services our tenants offer the Newark community. If you have a moment, take some time to browse our tenant directory. If you're just interested in looking at the kind of shops found at Market East Plaza, you find plenty of information, phone numbers and links to tenant websites in our directory. Maybe you're looking for a great location for your business? If so, give us a call at 302.420.6301, or drop us a line.